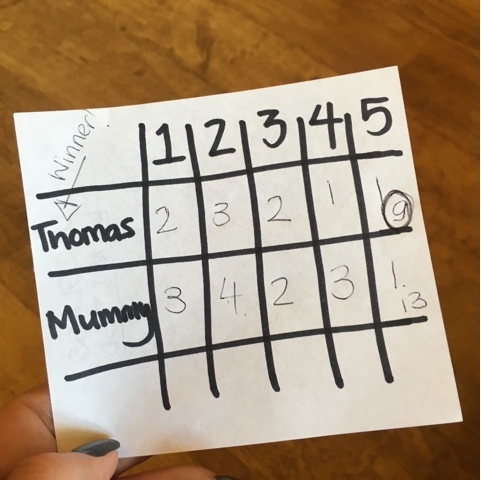 This activity is great for families or play dates and is lots of fun from start to finish! 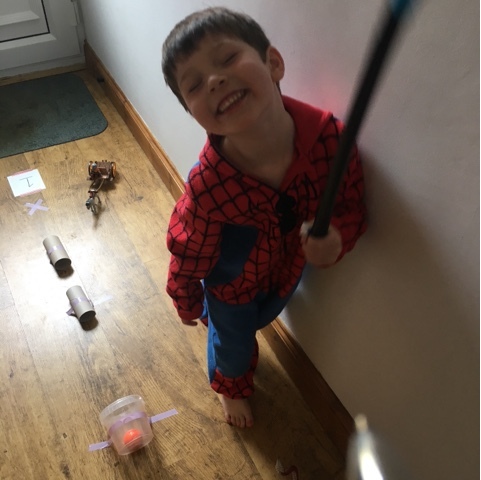 We actually had planned to do this with friends for a play date but we had to cancel at the time due to T being ill so in the end T and I did it together, I can see us doing this again in the summer outside possibly for cousin club through the summer. 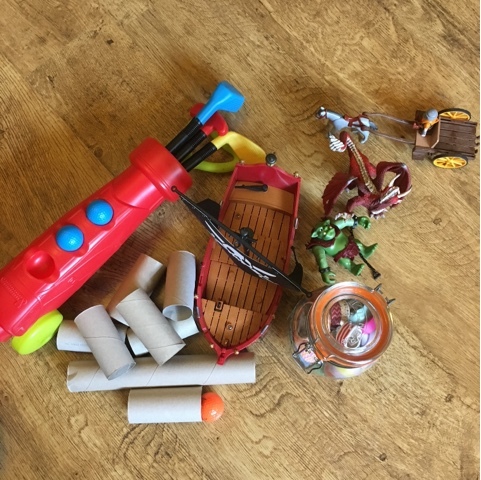 We started off by talking about the crazy golf we've done elsewhere and this lead to the props we used for our crazy golf, we went with pirates, dragons and castles for our theme. 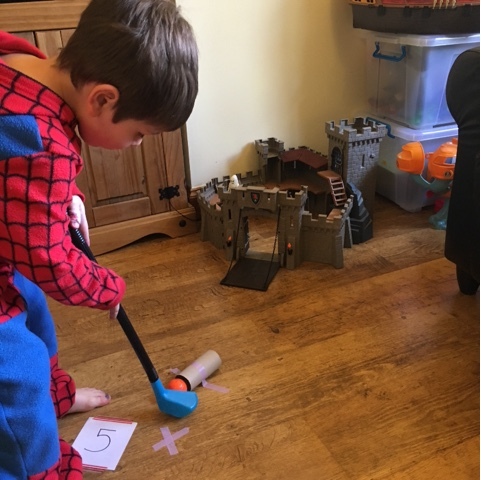 I only set up 5 holes for T as I thought that he would get board with the official 9 holes! 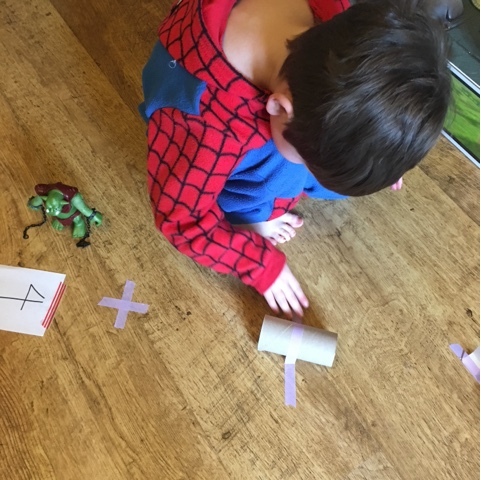 We started off by setting up the 'holes' using the loo rolls and washi tape, I tried to make each hole slightly different, T helped by sticking the loo rolls down, we also added a cross of washi as our 'tee' and added the number of each hole. At this stage T gave our holes a name, this would obviously be more fun with more children as they could either work together to think of the names or you could even have a little competition. 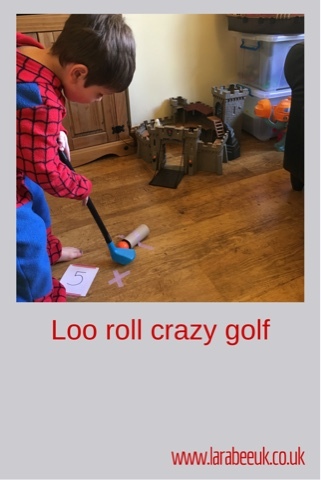 Hole 1 - this was just a simple hole to get the ball through 2 loo rolls into the cup, we called this hole 'knights crossing' and our prop was a knight on a cart. 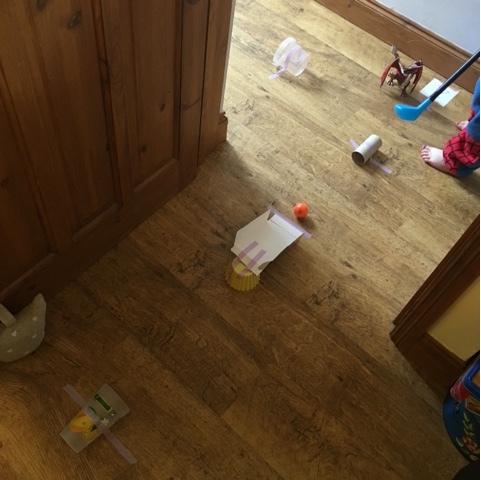 This hole took T 2(ish) attempts and as you can see, he was pretty chuffed with himself. Hole 2 - Dragon mountain (not sure where the mountain is!) for this hole, we made a nice and simple ramp using a cardboard box and a small dish, the idea being to go up the ramp and down into the cup. 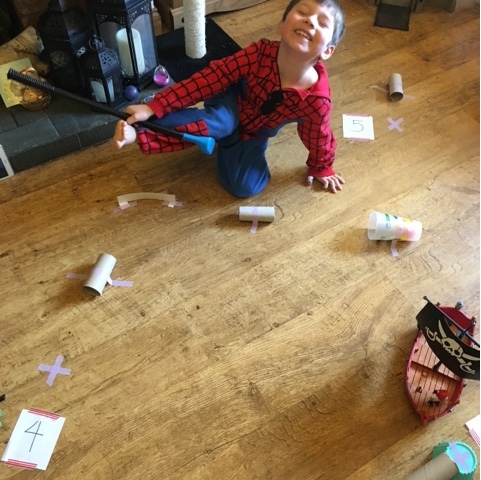 Hole 3 - pirate ship T came up with this one himself, he attached a long tube onto an upturned dish and secured with washi, the dish acted as our Tee in this instance as you can see, a cup is placed by T's toy boxes to roll the ball into! 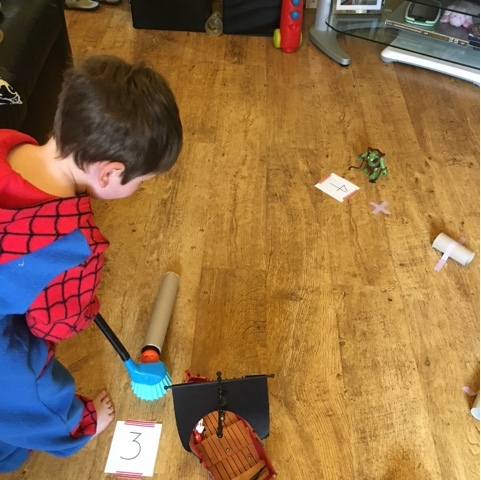 As I said, it would be absolutely perfect as a play date activity, there's s little bit of problem solving - setting up the holes, co-ordination - putting and maths - keeping score. We're joining the Playdate Activities Blog Hop hosted by Crafty Kids at Home take a look at some of the other fantastic posts also participating, like Crafty Mama in ME's How to plan cupcake decorating and this Edible chocolate playdough from 3 Princesses and 1 Dude!, a fantastic creative art collage from Clares little Tots and Fun with a ball of string from Teach me Mommy. Much more fun than crazy gold! Great idea for an activity. It looks fun and he had to think a lot too. Very simple, which is often the best. I'm in LOVE with this idea. Perfect for rainy days as well and I love that the kids can make the course up themselves. Bet he was so happy he beat you ha!